Usually we have to hunt for, or be inventive about, the theme for a given post. Happily, while looking at last week’s pictures, the theme became perfectly obvious. That’s good news since this is a procrastination post and I don’t have any extra wiggle time. We love those bad craft pamphlets. Usually we make fun of the pictures, but this week we found real-life examples of projects we have laughed at in the past. 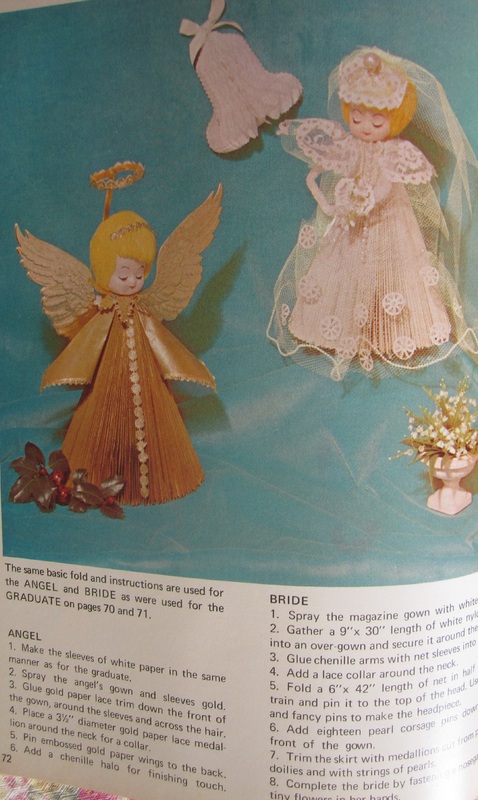 Do you remember the folded magazine crafts? This goes the angel one better by adorning her with paper doilies spray-painted gold and jettisoning her arms. I think she isn’t going open her eyes until, well, never. If you don’t look at the wrongness, you can always pretend that everything is still copacetic. We did feel sad about the wedding picture in the background; they were several of them scattered over the shelves, and they deserved better than to be touched by an angel. Of course there is a glass bottle inside of the body, along with the pom-poms and button eyes outside. It’s hard to believe, but Fifi didn’t come home with me, which might account for the worried look on her face. Sorry I can’t find the pattern for Fifi; I know it’s somewhere, but locating it might be a lengthy procedure. 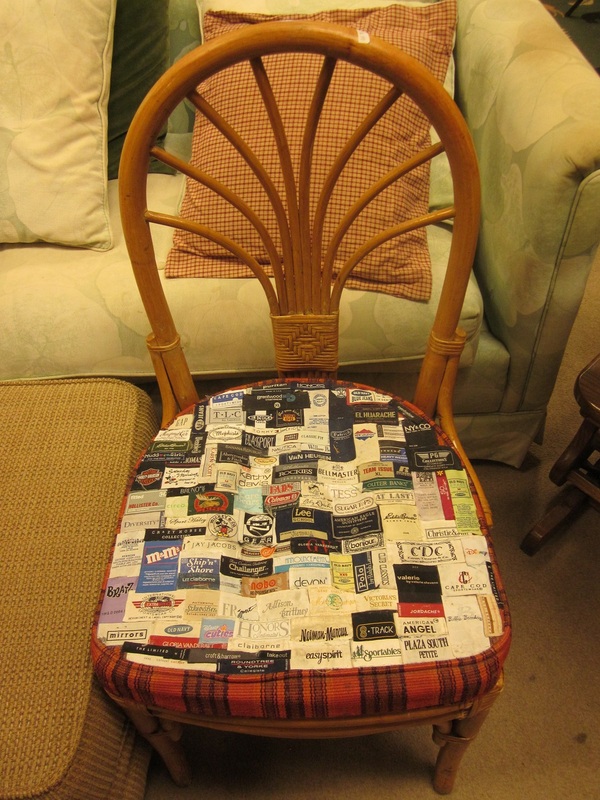 I’ve seen a man’s smoking jacket on Antiques Roadshow, that was made from fabric cigar bands–it was absolutely fabulous! 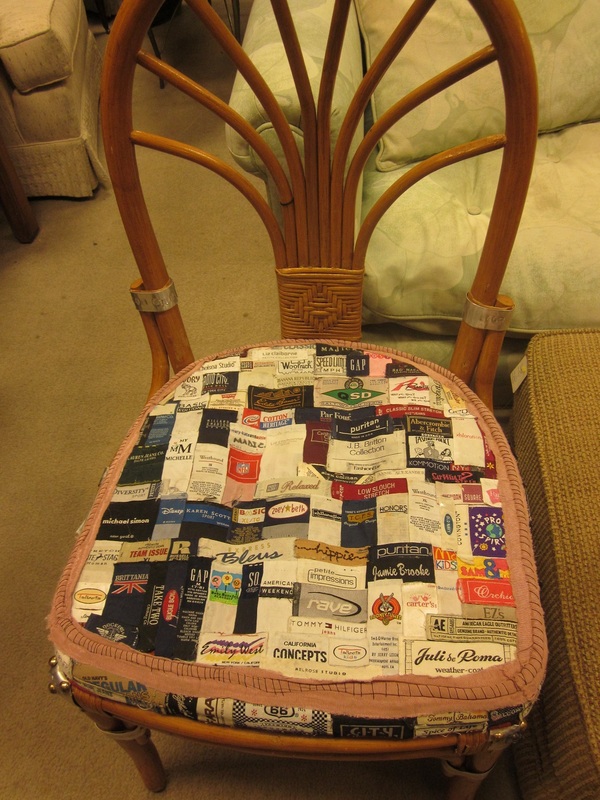 While there was a lot of work in these two chairs, they sure don’t merit a “fabulous” label. These two innocent boxes were just minding their own business, when they were decorated/assaulted by a glue-gun-wielding maniacal crafter. 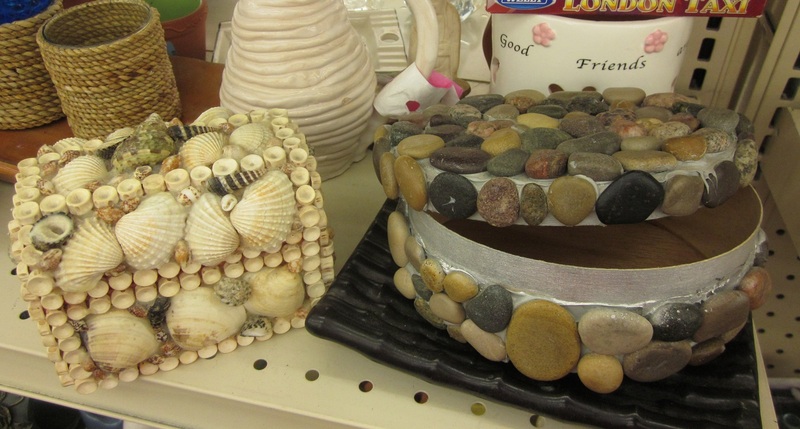 To tell the truth, I don’t mind the shell box nearly as much as the box o’ rocks. The rocks aren’t even fancy polished rocks; they look like the were collected along the side of the road. Maybe they bought the shell box on vacation and decided it would easy to decorate boxes with found items. Ummm, NO! 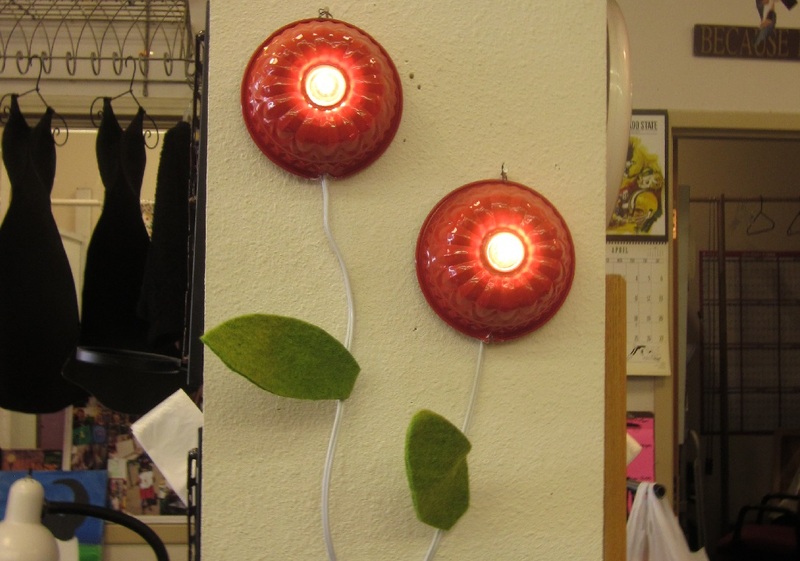 These lights could work in the right room, I suppose. The cyclopean look is sort of disturbing, but that could just be me. They have a nanny cam vibe to them also–“Smile, You’re on Candid Camera” or “Open the pod bay doors, HAL” if you like. If these pieces of statuary had been broken early on, we would have been spared this scene. They actually have prices of more than 1¢, so folks with guns probably wouldn’t even buy them to check their sights (however satisfying that idea might be for us to contemplate). 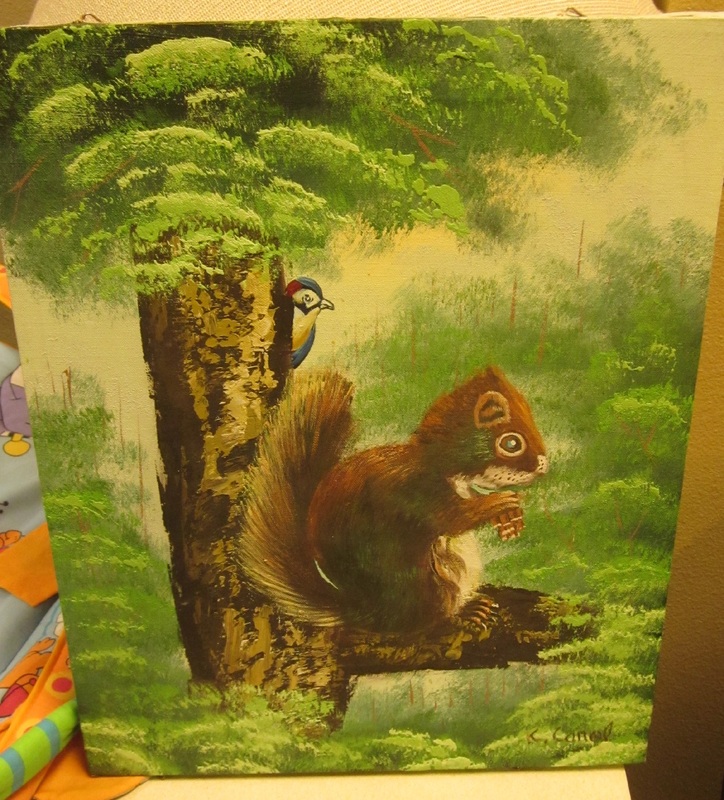 The squirrel has a Zippy the Pinhead point to his head, and he appears to have a fungal fur infection. As disturbing as the squirrel is, I’m way more concerned about the angry bird looking over his shoulder. There really isn’t anything in the scene to justify the bird’s expression, but that squirrel had better get a restraining order, pronto! Also, am I the only person that thinks Bob Ross owes the world a big, fat apology? 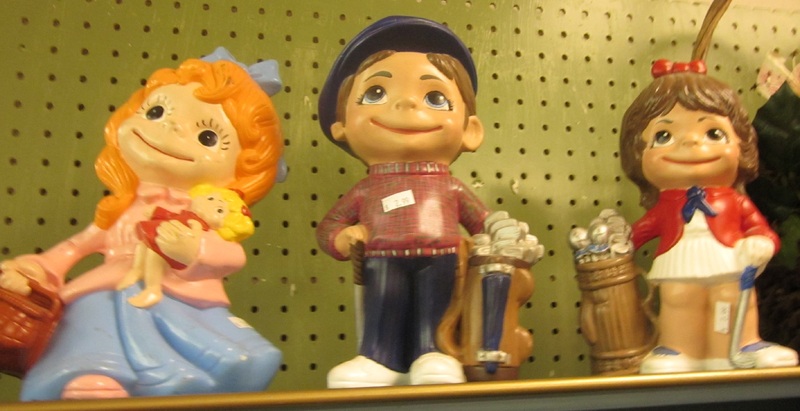 We know why it’s at a thrift store–there are no redeeming features here, except perhaps the victim. 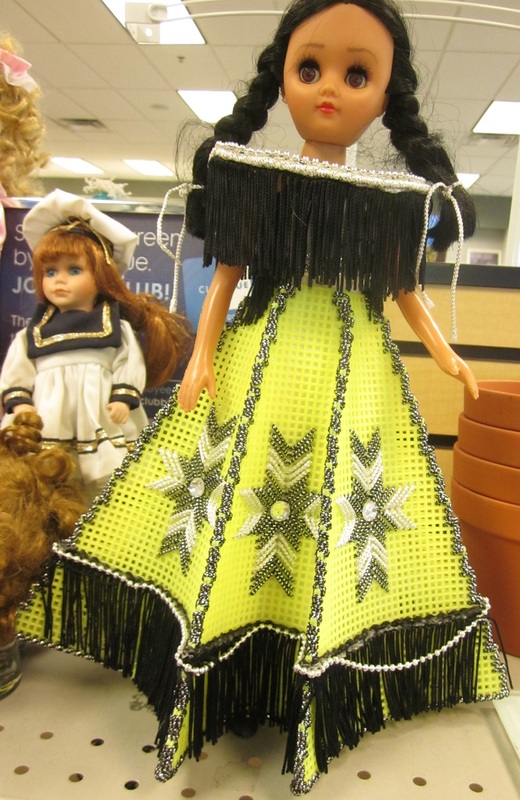 This poor girl is probably thinking, “Why couldn’t she have crocheted a garish, yarn Native American costume complete with feathers?” Maybe the poor dear will get a second chance at life at the 50% off sale this weekend. The first strike is that it’s made of the same plastic mesh that you put under rugs to keep them in place. 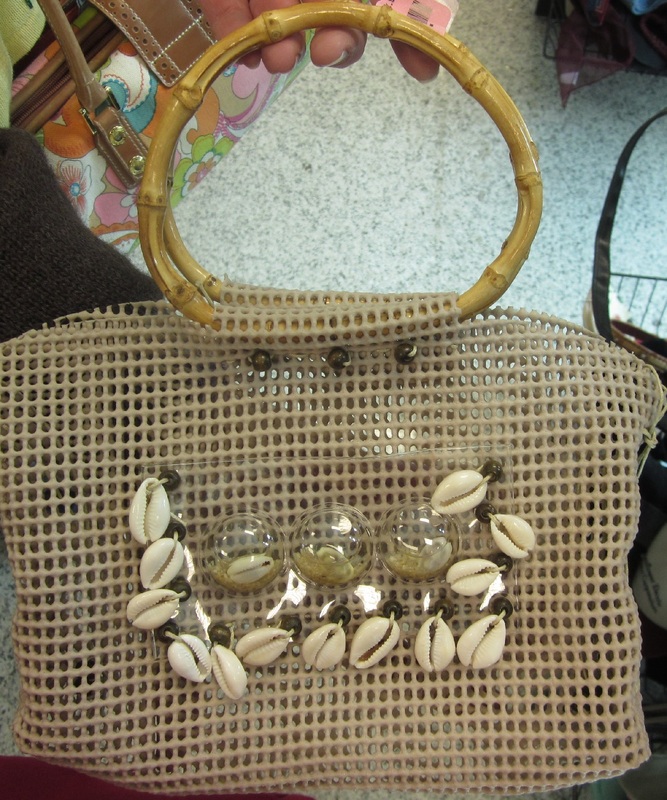 When you touch the purse, you can’t help but say ick! Strike two is the random placement of the shells. If you look closely at the central bubble shells, you can also see sand, and a liquid in the bubbles (strike three, you’re out!) Is it supposed to make you nostalgic for the beach? Thanks for reading; garage sale season should be starting up soon, which is double the trouble and double the fun! 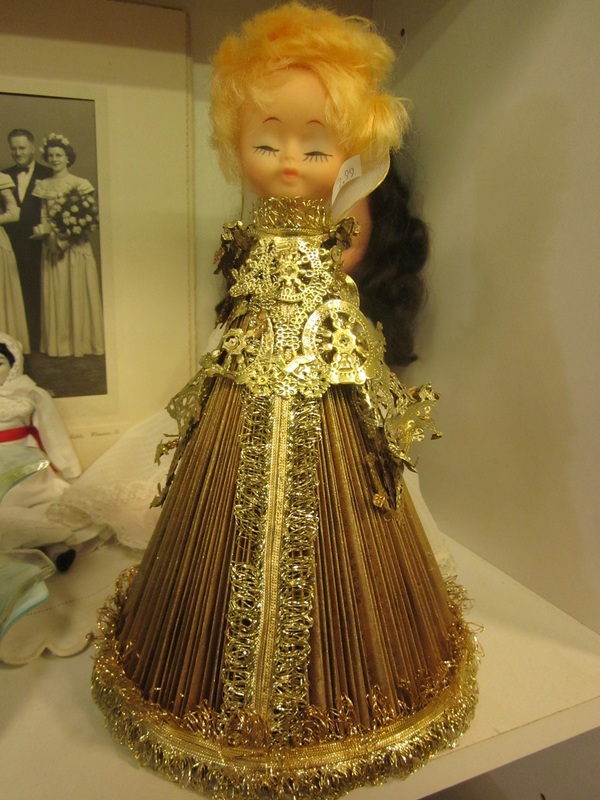 This entry was posted in Friday Finds and tagged Angels/Cherubs, Animals, Bad Decor, Crafts Gone Wrong, Dogs, Dolls, Flowers, Lamps and Lighting, Purses, Shells, Yarn Play. Bookmark the permalink. 6 Responses to Happiness is Homemade? I have to admit that I love the label idea and it makes me sad that I’ve discarded so many good ones. The bundt pan lights look like something you can buy at Ikea. You can; I won’t. I hate squirrels, too. 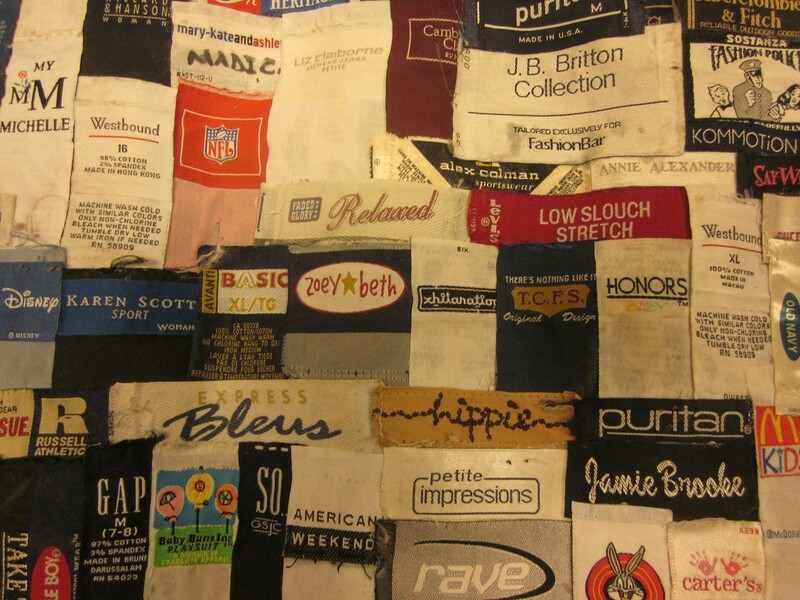 We think that labels can be a really cool idea too–the maker must have the patience of a saint to sew them all together like that. Glad you liked the post! Eeek! I am having flashbacks of magazine craft projects. And to make them extra icky, the resulting masterpiece was generally spray painted with either gold or silver (as depicted by the slightly sleepy looking angel above). 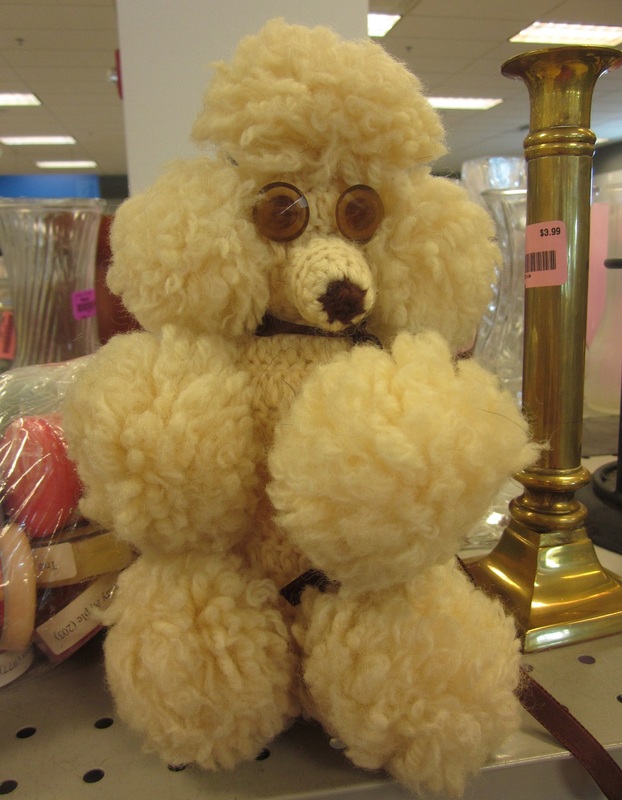 But I am hypnotized by the pom pom poodle. All it needs are spinning pupils and I would be at it’s beck and call. As David Letterman used to say–hypmotized! We feel another craft project post coming on in the next couple of months–I found a couple of fun books! No worries, I didn’t buy the squirrel for Todd; it was $10!